Apparently this has been circulating via email and web for a while, but new to me (origin unknown). 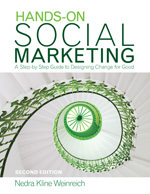 Thanks to Nancy Lee for passing along this social marketing branding inspiration. Nedra – fun post. thanks for the end of the work day laugh.